I've been trying to find out more about the competition for the new Albanian Parliamentary comlex. The website at Europaconcorsi provides links to the websites of the competitors. Not all of these provide information on their entries for this competition, but it's possible to get an idea of their approach and to see some other projects they have been involved in. Samyn and Partners. This is one of those annoying flash based websites. To find the relevant photographs go to Studies and Competitions then Public Services and select the photograph on the right. they all look better then the one selected. But than again, they also were pure foreign plays with no Albanian involved to grease the palms of purse handlers. All this story, following that monstrous plan of Architecture Studio, is a big political madness. All competitions are always a little bit suspicious, but these tow have crossed the line. Tirana doesn’t have a decent library or a theater, and there hasn’t been additional public spaces to the city for 30-40 years now (on the contrary they are disappearing), but our politicians agree to spend 50ml $ in a monstrous project that destroys not only the character of one of the few decent buildings on the boulevard, but also the single last public spaces that has survived. Really what is the point of our politicians having such a nice place? Do they deserve it? The design looks great but do they need a better place to do a better job? My tax money is being wasted on a nice building. The Albanian government should spend money on education, social issues, police force etc etc. We have enough nice buildings/restaurants/bars in Tirana. I did wonder whether the role of Albanian architects/studios was a factor in the decision. Only three of the finalists had an Albanian component. I agree that Tirana is more in need of high quality public buildings and public spaces than a new Parliament building, but when even the mayor of Tirana is backing the project it seems unlikely that it will be set aside. 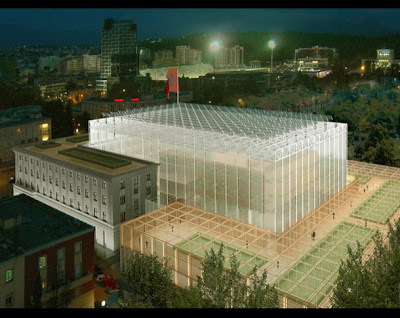 this project is Rama's baby, and is featured in the Architcture Studio's project for the center of Tirana competiton in 2003 in which Rama is the real architect behind. Everything nowdays in Albania is done so to appease Rama. And yes since the jury was selected by albania architects (Shkreli one of them, Rama's best friend by the way)they have to abide by their rules.